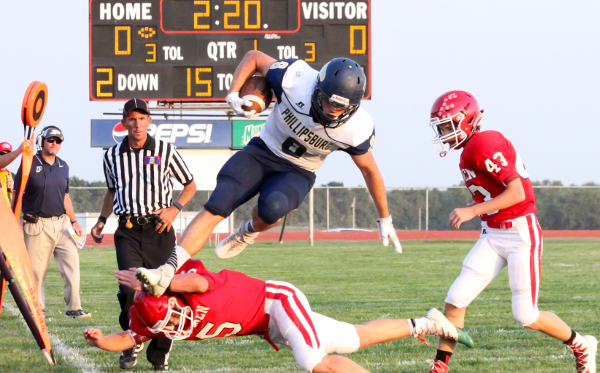 Kpreps.com would like to congratulate Rachel Martin for submitting the winning photograph for Week 2 of the Kpreps Friday Night Photo Contest. Rachel’s photo captures Phillipsburg running back Kirk Coomes (8) leaping over Smith Center defender Colton Hutchinson (5) while Colby Benoit (43) pursues the play. Phillipsburg, No. 3 in Class 3A, defeated Class 2-1A’s top-ranked Redmen, 23-0. For this winning photograph, Rachel is now eligible for our 2017 Grand Prize including $500 in cash.